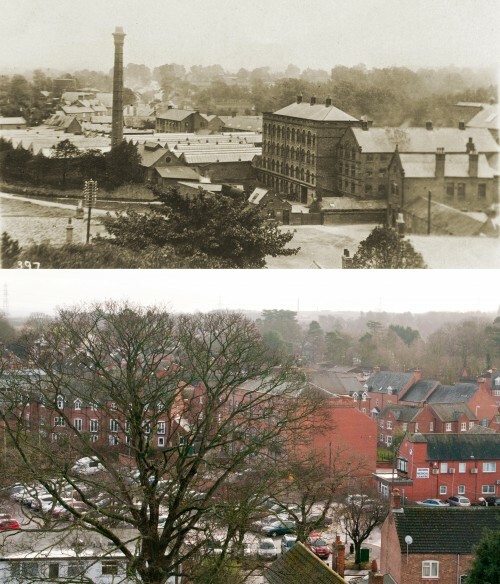 These photographs were taken from the top of the Church tower, looking towards Wright’s factory over Station Road. The older picture was taken in about 1914 and the newer picture in February 2013. The scene has changed significantly in 100 years. The main mill building has been reduced by one storey and converted into apartments. The chimney was demolished in 1998 and since then much of the site has been developed for housing, although the factory continues to thrive in the large area behind the housing and School Lane. The large tree on the newer photograph is frustrating, but through it can be seen the Quorn’s main car park. At the time of the first picture, this was the village green, although it was known as the ‘black green’, so may not have been as idyllic as it sounds.